HydroStar Onion Tanks (also known as blivets and pumpkin tanks) by GEI Works are an excellent emergency water storage solution. Whether onion tanks are used to store firefighting foam or fire suppression water or to aid in emergency relief efforts, these self-rising tanks are an ideal collapsible water storage solution. 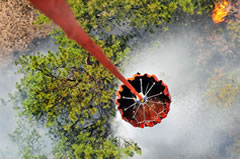 Onion tanks can also be used as water sources in aerial firefighting when helicopters refill buckets or dip tanks when used to suppress wildfires. The HydroStar Onion Tank has both simplicity and reliability as it requires only one person to set up and minutes to fill. Once a hose is attached to the ball valve the 250 to 10,000 gallons of water is available for use. With a high quality interior made from vinyl, urethane, or NSF 61 approved materials, the GEI Works' HydroStar Onion Tank is built to perform in a variety of challenging conditions. The materials used resist mildew and rot when storing, but should be air-dried as much as possible prior to longer-term storage. As a result of the quick set up and self rising nature of the dump tank, they can be folded up with the ease of similar bladder tanks but faster to fill. 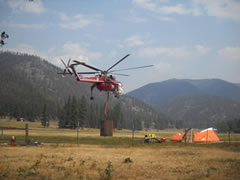 Plus, they can be placed in the back of a firetruck, water tanker, or most other vehicles to get to a site quickly. The low profile of the HydroStar Onion Tank makes it a viable alternative or back up to bulkier tanks and it ties up fewer personnel to deploy in the field. The two inch bulkhead and plug fitting can also be used to manifold numerous onion tanks together to act as a larger reservoir of water to pull from when fighting fires. The smaller size of onion tanks makes them suitable for areas within urban, rural, and remote situations where another type of liquid containment tank may be restrictive due to size, mobility, or shape. Place a liner on level ground free of debris, then open the onion tank on top of the liner and fill, it will self-rise as it fills to capacity. 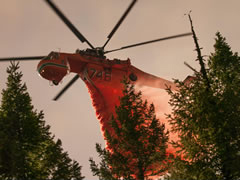 HydroStar Onion Tanks are ideal for numerous practical applications outside of fighting fires. In rural environments, they can be useful to prepare a readily available emergency water supply prior to a natural disaster, such as a hurricane, or set up after to provide a source of potable or non-potable water to individuals following the disaster. They have been used as dunk tanks, baptismal tanks, and carnival fishing ponds. Onion Tanks have been utilized in hydroponic, fry farming, and other agricultural applications. In addition to firefighting and emergency relief efforts, HydroStar Onion Tanks have been used in military, agricultural, environmental, and research projects. As each tank can be built with custom materials depending on the liquid being stored, HydroStar Onion Tanks can be optimized for decontamination, as a fuel tank, gray or black water containment, or recovering oil following an environmental disaster. *We may require customers to provide us with an SDS (Safety Data Sheet) to help confirm compatibility with the chemicals you will be storing in the onion tank. For more information, please visit our Hydrostar Onion Tank Overview or our Hydrostar Onion Tank Specifications page. If you have questions about the Hydrostar Onion Tank, please call at 772-646-0597.